All of the parts needed for a home built delta style 3D printer. 3D printing with soft materials like clay or food that doesn’t instantly harden the way plastic will isn’t easy to do. Despite the material only being printable in a lower resolution, it actually requires a machine that is more precise and steady. Soft clay can easily tip over if the printer shakes too much, or is bumped by the printing head moving too fast. That means that anyone attempting to build a paste extruding 3D printer needs to balance the printing speed with the texture of the material in order to make sure hours of printing won’t go to waste. Because it is such a tricky 3D printer to get right, there aren’t a lot of them on the market. In fact, most of the clay and paste 3D printers that I’ve seen have been developed from scratch by home builders and makers. After enrolling in a Digital Fabrication and Craft class at the University of Wisconsin-Milwaukee, artist Duncan Martin was given a “Machines that Build” assignment. Students were tasked with developing or reinventing an art, craft or design process using a machine. As a student studying ceramic art, he decided to try building his own clay 3D printer. Martin chose a delta style 3D printer because it is easy to scale up or down, depending on the desired build envelop and he wanted to be able to achieve a larger print height. “For the paste extruder I tested a few versions using auger screws and Moineau pumps ending up with one that worked the best. My final goal was to have a large build area and an extruder that could control how much clay would be printed with a stepper motor,” Martin explained. As with most home built 3D printers, Martin’s clay printer is made of easy to acquire parts, 3D printable components and an acrylic base cut into shape using a CNC router. The printer is pretty massive and can build object over 3.5 feet tall with an 11 inch diameter. For the most part the printer design is his own, but Martin did use the basic structure and scaled up parts from the open source Rostock 3D printer design. The total cost to build and construct the printer only cost him about $420, with the motors and electronics costing $150 and the structural parts costing $270. He has uploaded all of the 3D printable parts onto Thingiverse so anyone can try their hand at building their own clay printer. Martin’s printer is still a work in process and he is continuing to develop it in order to get everything right. Because he has had problems with the clay not drying fast enough to maintain it’s structure, he has slowed the printing speed down considerably. Martin says that for now it will take about 45 minutes to 3D print a cup that is about four inches tall. He is also trying to refine the process of getting the clay to the extruder. Currently he uses a pressured bucket to feed the clay through a tube and out of the extruder tip. Unfortunately with that method the clay that he has to use is too thin to be printed any faster than the speed he has currently been able to reach. However is he working on developing a way to feed a thicker clay material through the tube so he can increase the printing speed. 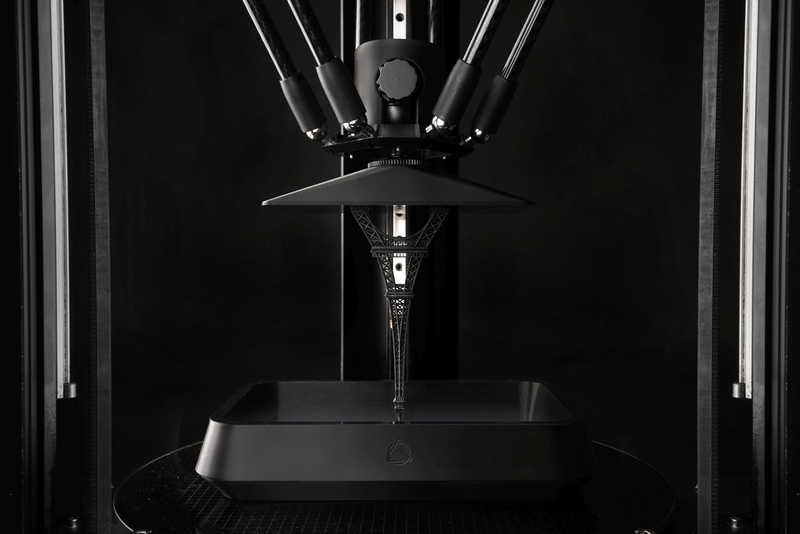 Let us know what you think about this project in the 3.5 Foot Delta Style Clay 3D Printer forum at 3DPB.com.